The Shore can be unlocked if you obtain all nine pieces of the Forgotten Shore Map. You can win pieces through the Anchor Management daily, or you can purchase them from other users on the Trading Post, Auction House, and Shop Wizard. 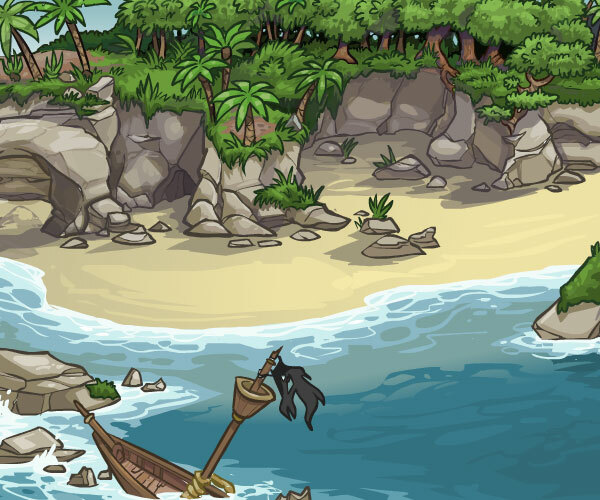 Upon completing the map, you will be awarded up to 20,000 NP and granted access to the Forgotten Shore. You can find information on the pieces, including their prices, in our Item Database. Once you have all nine pieces in your inventory, go to the treasure map redemption area. You only need to redeem the map once. From now on, you will be able to access the Shore through this link. A secret area on the Krawk Island map will also lead you there. You will be presented with a large image of the shoreline. When one of the objects shown below has washed ashore, clicking anywhere on the image will grant you a prize. You are not guaranteed to be able to click and find a prize every day you visit. 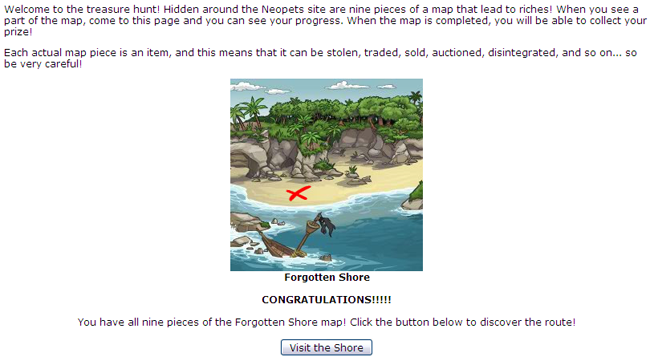 You can only collect one prize per day; the shore "resets" at midnight NST, like many of the other dailies. The items below can be won from the Forgotten Shore. In addition, you can win 2,000 NP, 5,000 NP, and 10,000 NP.